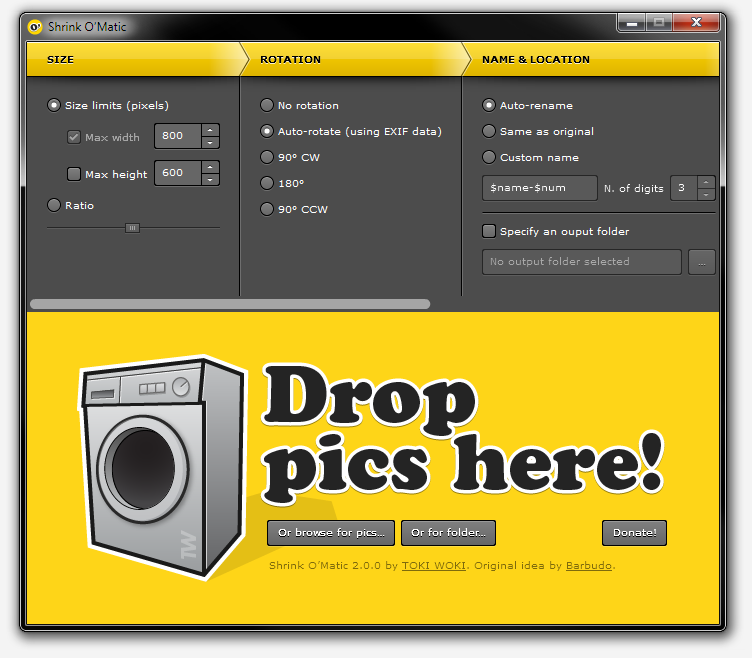 Simply drag and drop images and they'll be resized as you wish! Options allow you to choose the output sizes, rotation (supports EXIF data), names and location, formats and watermarks. If you get an error when trying to install the app, here’s a direct link to a “self-signed” version of it that should work just fine. More details in this comment. Fixed a bug where max width and height checkboxes where ignored, thanks to Ahni. Improved scrolling on settings, minor visual tweaks, fixed watermark bug on OSX and Linux, added (back) the ability to drop images from the browser, fixed extension case sensibility. Brand new and improved 2.0 app, re-written from scratch. Intermediate version to the brand new 2.0 app. Support for transparent PNGs, thanks to Vinicio. jpEg files now work, thanks to Marc. Experimental drag 'n drop from the browser, thanks to Johan. Updated for AIR 1.5.1. Fixed NacaYoda's upscaling bug. Updated for AIR 1.5. Fixed Robc's bug. File list fix (Thanks Bilal). Enhanced smoothing (Thanks envrac.org). Load error handler. Added "the brain" to the credits! Fixed the upper-case-extension-file-drop issue. Added an output directory option. Moved to the AIR 1.1 namespace. Filename changed to "Shrink-O-Matic" for maximum compatibility (Thanks Emme!). Added a small indication about the output directory. Some classes used in this project are available. Drop a comment on Shrink O’Matic's blog post!